The Griffith 500 sports car. 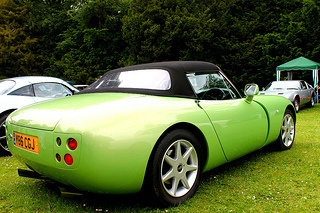 Throughout 1992, the engine capacity of the TVR Griffith sports car was increased gradually from the 4 litre unit at its launch earlier in the year. The first increase was the high compression version of the 4 litre unit, which incorporated a high lift camshaft. This produced 280 bhp at 5500 rpm, and 305 ft/lbs of torque at only 4000 rpm, which gave it a top speed of 158 mph, a 0-60 mph time of 4.6 secs, and a 0-100 mph time of 11.3 secs. Understandably, customers preferred this variant over the 4 litre standard unit. It was well received by the motoring press. Later that year, a 4.5 litre variant was introduced, which developed 285 bhp, and 310 ft/lbs of torque. This produced a top speed of 158 mph, and a 0-60 mph time of 4.6 secs. 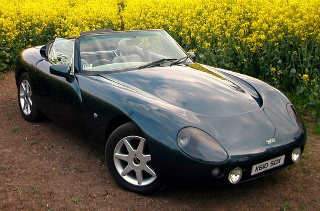 Production of Griffiths for the home market was halted in December 1992 so that export orders could be fulfilled, and to concentrate on the TVR Chimaera, a sister model of the Griffith. 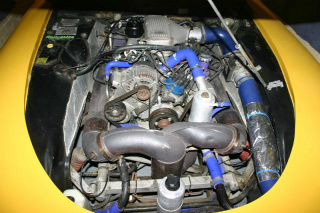 By this time, TVR's own engine, the AJP8, was almost ready to be fitted to the Griffith. However, following delays in producing the AJP8, and demand for the Griffith steadily increasing, in August 1993, a 5 litre version of the Rover V8 unit, that had been developed by TVR, was used instead. This final variant gave rise to the designation Griffith 500 with which the model became universally known. As far as the press was concerned, the Griffith 500 was a resounding success, with one commentator even suggesting that it was "overpowered". In this iteration, the engine developed 340 bhp at 5500 rpm, and 350 ft/lbs of torque at 4000 rpm, which produced a top speed of 169 mph, a 0-60 mph time of 4.1 secs, and a 0-100 mph time of 10.5 secs. However, when fitted with a catalytic converter, output was reduce to 320 bhp. Production of left hand drive cars for Europe began in early 1993. In 1994, the gearbox was changed from the Rover SDI unit to the near bullet proof Borg Warner T5 Tremec. In 1996, the Griffith Speed Six sports car was premiered, fitted with the TVR designed AJP 3996 cc, straight 6-cylinder engine, developing 380 bhp. However, in the end, this model did not enter production. With the pending re-introduction of the Tuscan in 1999, sales of the Griffith 500 had already begun to tail off. 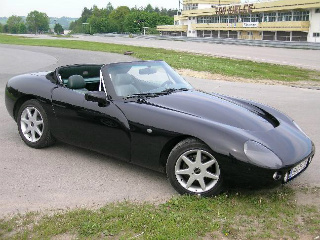 Since the TVR Chimaera and Cerbera models were also being produced at this time, the company decided, in 2000, to slowly phase out the Griffith. This was achieved by the introduction, in 2001, of a 100 unit limited special edition (SE) version of the car. Each individual SE car received a special plaque in the glove compartment, a special edition badge positioned on the boot, and a unique signature in the floor of the boot. Although the Griffith was a fabulous looking sports car, its weakness was in terms of practically. This was overcome with the Chimaera which was, in essence, a Griffith with a larger boot and softer suspension, but equally as fast. A high mileage 1993-2000 Griffith 500 would fetch around £10,000/$16,000, whilst a good condition example would command anything between £14,000/$22,000 and £20,000/$32,000, with a really exceptional car fetching as much as £30,000/$50,000.